We are entering the homestretch of the semester with nine days until the final review. This last week has seen a lot of heavy lifting, a 1,686 mile journey across the country, and the installation of an exciting project that hopefully leads to a new way of thinking in the city of Las Vegas. We successfully completed the Waiting Game Parklet and installed it in time for Earth Day 2015 in Las Vegas. The experience was stressful at times, but overall unforgettable. I was fortunate to work with an excellent team from beginning to end, and am incredibly honored to have been featured on such an exciting project. The amount of people I saw interested and getting excited about the parklet leads me to believe this will not be the only one the city sees. It is a great step in getting people to rethink what downtown living in Las Vegas is like. I look forward to seeing what other projects like this pop up across the city. Tomorrow (Earth Day) is the official unveiling of the parklet to the city and I am excited to hear about what they say about this groundbreaking project. Now that the parklet is completed, it's time to refocus on studio. Although there is still some work to do, I have high expectations with what our group can produce for our final review on April 29. A benefit of returning to Las Vegas for a short time is that I was able to re-visit the site after a couple months have gone by and see how the site has adapted with the refocusing of downtown. While I was there, I witnessed a cool gathering of bikers at night that rode along Main Street and turned alongside our site to then ride down the First Street Art Trail. It made me feel good about our site standing as an exciting arts and social hub. What I will be working on over the next week is sections, section details, our section model, presenting the net-zero board in a graphically pleasing and efficient way, and perfecting renderings for the alleyway and Victory Social Club. Should be an exciting way to wrap up my final studio project. Can't wait to see the final product. Our 100-hour charette is over and now that the clock has hit zero, we have had a chance to reflect. It was an interesting presentation style we used, but it helped clarify a number of things about our project. Teams were given five minutes to look over another groups project and then present it to the class. In a best-case scenario, all the ideas came across because they were clearly explained on the boards. In our case, we had a little bit of good and bad. Our project has come a long way, and overall is in a great place, however the ideas we have are struggling to translate through our presentation. Be it the post spring break daze, the beautiful weather we've been graced with, or just a struggle to represent the ideas in the best way possible, we are aware of our faults and are back on track to correct them. Our discussion with our professor yesterday yielded has given us an inspirational push and I believe we have it in us to really push this project to be the greatest it possibly could be. Because of how passionate I am about so many parts of our project (alleyways, social club, net-zero, etc. ), it’s sometimes difficult to walk away from some of them for awhile, but we have to split up the work and I have full confidence in the team coming through and representing them in the best way possible. I have tasked with myself in polishing and perfecting our net-zero strategy for the site. This involves quantifying data and creating a plan for how all the systems-both active and passive- work together to achieve our goal of creating a net-zero site. Added to this portion of the project is the integration of sustainable sites (which combines the active and passive strategies with vegetation to achieve a beautiful and sustainable site) and working with my teammates on that will yield a holistic solution to sustainability. It’s truly fascinating when architecture and landscape architecture come together and push where the boundary between the two is. Graduation is only 36 short days away, and I am looking forward to see what we can make of this project and get some people excited about re-investing in the downtown area of Las Vegas. The next few weeks will be exciting… stay tuned. Our review went well this past Friday, as we talked with our reviewers about the many issues we’ve been dealing with and received feedback on what to address moving forward. We presented a TON of information, and a common criticism on our presentation was on the lack of contextual information surrounding the site. While we did mention what was around the site, it’s a different thing to show these conditions- and that’s something we didn’t do as well as we would’ve hoped. Another issue that came up was the lack of development along the east side of the site (First Street), something we have discussed as being a weak point up until this point and we need to address. With the criticism, we also received praise for some of the decisions we made involving the alleyway and the social club. Excited to see where these spaces will go, we are looking to really pushing the design of the architecture in these spaces over the next few weeks. Address the context of the site- show what we are dealing with around the site in our rendering and axonometric drawings. On Monday, we will be presenting to the dean of the college of design to get another set of eyes on our work. After that, it’s a week of work, our spring break, and then a week of charettes before we come upon our next major review on March 30. Over the last week I have been focusing my time on understanding the feasibility of a net-zero site, while also working on the programming and some details of what’s crucial to our site, the social club. Dubbed the Victory, the club is to act as a catalyst for the site and the surrounding districts as a gathering place, arts community, and a vibrant night scene for an area that has bits and pieces of all, but is lacking a cohesive theme throughout. Because the idea behind our entire project is an arts and social scene for young professionals and business people, the treatment of the Victory as a social club is crucial in the success of the site as a whole. I looked into precedents on social clubs, and found a place in Des Moines that offered some of the amenities that we seek to include not only in the Victory, but also on our site as a whole. In this example, it also operates as an adapted-reuse project, converting an old fire station into a vibrant arts scene in downtown Des Moines. Similar to our project, the Victory will be a historically rehabilitated hotel converted to a destination for people after hours. Beyond the treatment of the Victory social club, I have been looking into whether net-zero is an achievable goal for our site. Because of its location in southern Nevada, the site is perfect to implement active solar as a means to achieve net-zero. Beyond solar however, there are few technologies (maybe geothermal?) we can utilize that make sense or adhere to form based code. The success of our site achieving net-zero will lean heavily on how we design passively to reduce cooling loads. Finally, I spent some time addressing the First Street Art Trail and how it could benefit from the programs we will be introducing. The art trail is pre-existing and in its current state, stops abruptly at the northeast corner of our site. In its current condition, the art trail ends at the service corridor of the Golden Nugget casino and meets the backside of the casino and its parking garage. The buildings are less than pleasant to look at and therefore work against drawing people down the final segment of the art trail. Our proposal of creating the Victory, combined with the community arts center, seek to give the arts trail a meaningful end and hopefully draw attention and expansion to the newly conceived art trail. The 36-hour charette has come and gone, and we are beginning to understand the pros and cons of the decisions that we have made upon our site. Working with an interdisciplinary team of architects and a landscape designer, we were able to pursue some goals and develop an overall theme for site #1 and the Victory Hotel. Our plans to introduce a social club and enhance the arts in that area through the development just north of City Hall, and we began to think about the art trail in a broader context that would include linkage to the Smith Center for the Performing Arts and the Symphony Park development across the train tracks. We also thought of the site in a different way than usual- proposing the main circulation and activity to occur along the alleyway through activation of it. The 36-hour design charette was exciting and difficult at the same time. It was exciting to go “full throttle” for a small period of time, but it became difficult not going too into designing the spaces already. The goal of solving what we wanted the site to do is what ultimately held us back from going too far, but it didn’t stop us from dipping our detail-brains into trying to make a space feel a certain way. Moving forward, I am remaining on the Victory site because I feel it has the opportunity to become a great catalyst for the downtown region in moving people back there and spurring development along Main Street. I believe we have strong ideas and I am excited to push them further and see what this project can truly become. I am especially excited to see how the social club and alleyway act together to really draw people into the site and give the mayor something nice to look at from above. 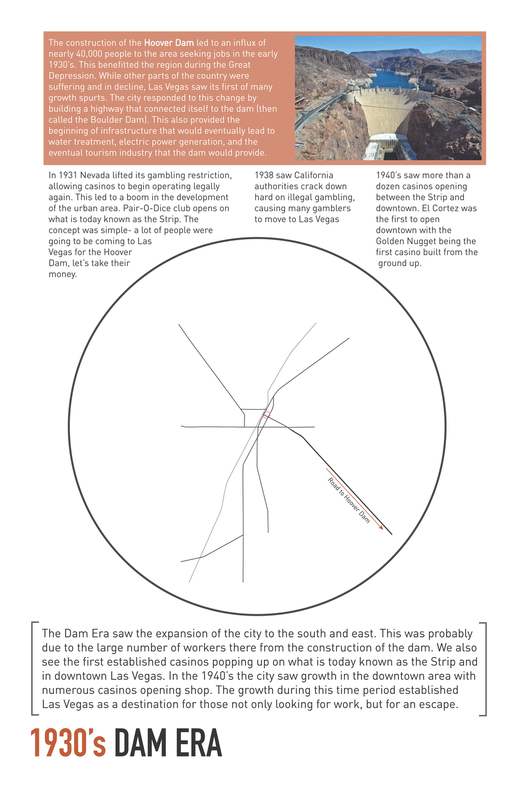 We presented our assembled timeline on the history of Las Vegas and received some helpful feedback. Overall, I feel everyone's presentation went well and I learned quite a bit. Perhaps the most insightful was the form-based code presentation because of how little I knowledge I had on it prior to yesterday. I think that there is still more to find about form-based code, but to begin with this outline was nice. It has yet to be seen whether we can make any sort of suggestions to the city for their draft of form-based code, but the one thing that irked me was its pass on sustainability. While I know from researching it that Las Vegas is a very sustainable city, I find it hard to believe that the “hiding” of sustainable technologies such as photovoltaic panels and wind catchers is the best thing to do. I think there must be something there that we can do about formed based code and trying to make sustainable technologies appealing and cool. Though my understanding is limited, my other concern about the form-based code is that if the code starts significantly dictating the form of the building, you take away opportunities for the architect to make great design. On one side, I see that being a non-issue, but since the rules are so loose as of right now, the potential for future changes that do start pushing for a “standardized” form would be more destructive than beneficial. The other presentation that really got me thinking was the one on character. The character of Las Vegas is typically the neon lights and gaming. While this is accurate for the Strip, I wonder what the case is with the Downtown Region. I know about the Fremont Street Experience and the Fremont East Entertainment District, but I wonder how development 5-10 years down the line would be centered upon. If true development is to occur downtown and people are to move down there, should neon lights be the focus? Is there another identity that we can promote? Or is there an opportunity to design one? These are all questions we will get to answer at some point throughout the semester I’m sure. Finally, because history covers such a vast period of time, it was difficult to tell the extent of Las Vegas history while also hitting all of the important points to take away. Because not every event is relevant it was difficult to decide which are worth mentioning, worth displaying, and worth emphasizing. It's important to know where you've been to decide where to go. The main feedback we got was regarding the mass quantity of information we presented, and to pick out the main points. Along with that, using the things we have learned and proposing what to do about it in the future. These comments are accurate, and I believe we tried to make an effort in highlighting that, but with such an overwhelming amount of information, we may have presented it in a less than stellar manner. We know and mentioned that the decisions made about the development of the city but may have not promoted them as the main idea as well as we could’ve. The importance of studying the history of the city and the development of it is so we can learn from what has been tried before, what worked, what didn’t work, and what can be improved upon. All of these things can help us to make decisions that are feasible and rooted in the downtown region we will be working in. Along with looking at the growth of the city, we have been looking at the development and strategies that the downtown region has taken in an effort to stimulate tourism. When looking at Las Vegas, it is important to note that when you mention Las Vegas to most people, they think of "the Strip" almost instantly and not the place where it all began- Fremont Street in Downtown Las Vegas. This is a look into the attempted refocus on that area. Looking into these projects, we see ideas that have been largely successful in bringing people into the downtown area. Two of the projects are focused on the Fremont Street region- Fremont Street Experience and Fremont East Entertainment District. Rightfully so, these areas are where the downtown region got it's start. Fremont Street is home to many of firsts for Las Vegas. 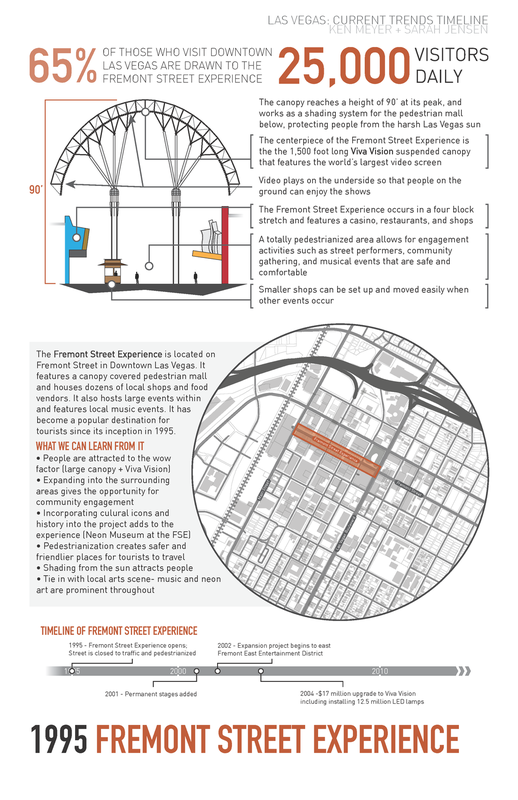 Above is an example illustration detailing the Fremont Street Experience and what we can learn from it. What is fascinating about this specific project is not just the architectural achievement, but the entertainment scene that has come to represent the area. The Fremont Street Experience has become a destination for tourists, and led to the redevelopment of the area to the east as Fremont East Entertainment District, and area with bars, clubs, restaurants, and nightlife as vibrant as the neon lights. More recently, the Downtown Project has become a headline in the redevelopment of Downtown Las Vegas. With Zappos' CEO Tony Hsieh contributing $350 million to the collective of business owners and developers (he too is a part of it), and all controversy aside, the project has good intentions to foster growth and re-establish Las Vegas as a destination for entrepreneurs. The Downtown Project has invested in numerous local businesses and has poured money into infrastructure improvements in an attempt to breathe life into downtown. Overall, these discoveries can bring to light some of the things that make projects successful, and to note some of the struggles that projects face while developing in this ever changing city. With the field trip not too far down the road and while we are all excited to soak in the neon lights, we look to first understand. In order to fully understand the city in which we're intervening, we must spend the time to research the city and figure out what it is we’re dealing with on these sites. I have been tasked with researching the history of Las Vegas. 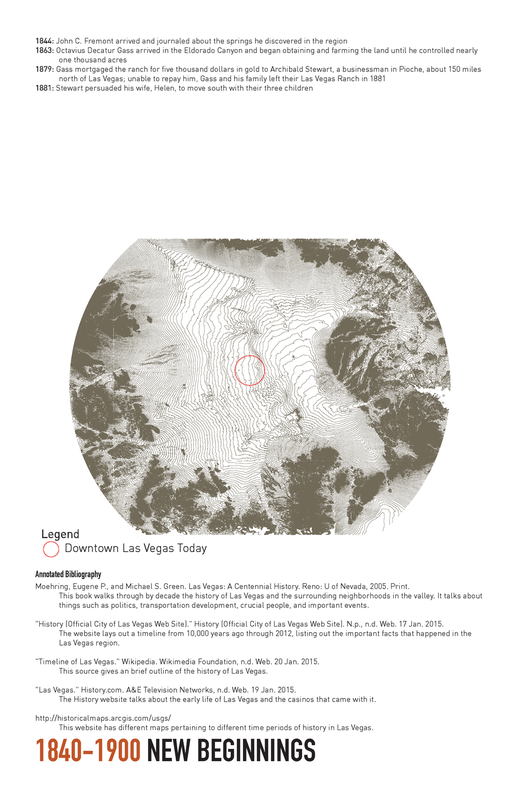 While I began my research looking into the entire timeline of the city, from the settlement of the Mormon’s to the mega-resorts on the strip, it became overwhelming as to how much information was there. The difficult part was filtering it to find out where the important events and what they taught us. 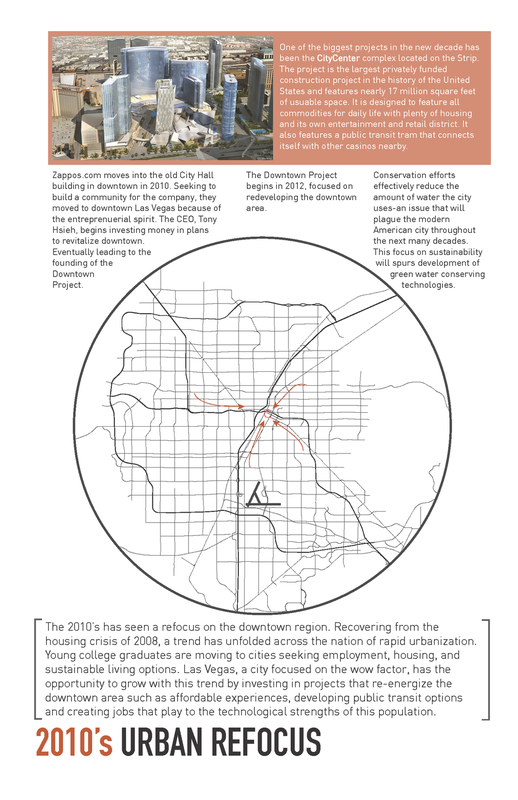 These "eras" show different trends that happen in Las Vegas and nearly every American city. My challenge will be documenting them in a format that effectively shows these trends. What I am excited about is pulling all of these changes together and identifying what has and hasn't worked as well as what the current trends appear to be. As a millennial, I am caught up in the urban re-focus that is currently going on, and in Las Vegas I am looking into what the city is doing (and can do) to bring the younger population in from the suburbs and into the downtown area- which has plenty of opportunity for development. This semester we will be working on community enhancement projects located in Downtown Las Vegas. I am really excited to delve into this project because community enhancement projects really interest me. We are beginning with research on the city of Las Vegas and I have volunteered to research the beginnings and history of it. I am particularly interested in how rapidly the city changed over time - how it has been invented and reinvented over and over. One of the first exercises our class did was to establish qualities we would want people working at our firm (thinking 20 years ahead) to have. I found this an interesting assignment because we essentially laid out what we should expect of ourselves.